Bismarkia Palm - Bismarkia Noblis This is a very striking fan palm from the drier plains of west and north Madagascar. It needs a lot of space, growing in cultivation to a height of 12 metres from a single trunk with a spread of 7-8 metres wide in a sphere shape. It's best grown as a feature palm in the open but can be grown in confined spaces and be kept trimmed, worth the effort either way as is stunning. 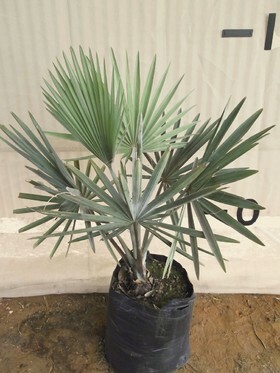 There are 2 different colors these palms grow to be one is the is silver grey and is a little more cold tolerant to -3 degrees c and will recover from -6 degrees c, the other colour is green and is not quite as tollerant. The fronds on these palms reach 3 metres across, they are curved and will fill up different spaces around the single trunk. It will tolerate drought and has no diseases. The male and female flowers are on different plants (dioecious). Possibly not a suitable palm for Melbourne or Western Sydney.